The Garden of Gears are a baseball team owned by Bill Moore formed and based out of Mesa Arizona. The Gears have played in the Pecos Spring League in 2013, 2014, 2015, 2016, 2017 and 2018. The Gears played in the Pacific Southwest Baseball League in the late 1990's and 2000's before the league folded.. The Garden of Gears also played Connie Mack, Babe Ruth, NBC and AABC tournaments throughout the Southwest and Arizona. Albie Lopez, Andre Either and Paul Konerko played for the Garden of Gears in their amateur days. The name Garden of Gears was owned a car dealership that Bill Moore owned and it was a natural for the Baseball Team. The teams colors have always been Black and Yellow. When Bill Moore was a kid growing up, his family was Farmers and Ranchers in Central Arizona. Every year all of the ranchers would have a cattle round up in Pumpkin Center. Bill Moore's granddad Yancey Orville favorite saying was lazy SOB. At Age 10 Bill Moore drew the brand with the letter that lays on its side which is the S. Bill later registered the lazy SOB in Arizona and has used it ever since. 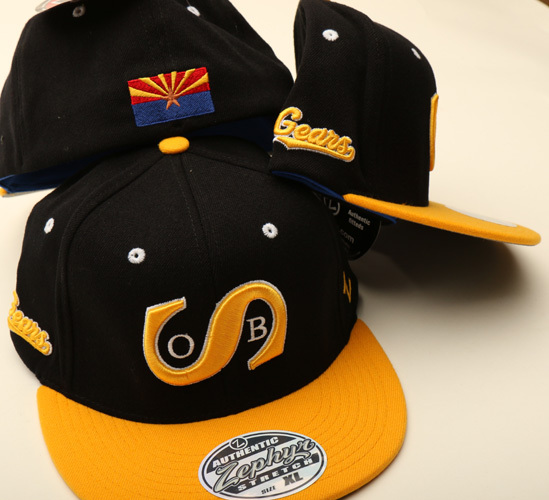 Today the hats have never been brighter and sharper with the 2017 Zephyr Hats incorporating the Arizona Flag.